Be the first to share your favorite memory, photo or story of Marthada. This memorial page is dedicated for family, friends and future generations to celebrate the life of their loved one. Marthada Thompson Reed, 96, of Columbia passed away on Sunday, January 27, 2019 at Tiger Place. She was born October 28, 1922 in Mineral Wells, Texas, the daughter of Jack and Norma (McMillian) Thompson. She married Richard D. Reed on July 17, 1959. He preceded her in death on November 27, 2013. Mrs. Reed was a graduate of the Arkansas School for the Deaf, Little Rock and of Gallaudet College, Washington, D. C. in 1950. At Gallaudet, she was a member of the Phi Kappa Zeta Sorority and a recipient of the Gallaudet Drama Trophy for 1946. During summers, she studied dance under Ted Shawn at the Jacobs Pillow School of Dance in Lee, Massachusetts, and under Mme. LaMeri in New York City. She taught at the junior high school at Missouri School for the Deaf in Fulton from 1950 to 1960, and from 1963 until her retirement in 1987. During her early teaching years, she had the extra assignment of teaching girls physical education at the junior high and high school levels as well as boys and girls P.E. at the primary level. As an additional P.E. activity, from time to time she organized and sponsored large-scale dance programs which included traditional numbers and modern dance routines. In 1980, Mrs. Reed was chosen as MSD’s Teacher of the Year and in 1984 she received the Missouri State Handicapped Employee of the Year Award. She was also recognized with the Truman L. Ingle Award at her retirement in 1987. With the founding of MSD’s Burney Fishback Museum by Superintendent Lloyd A. Harrison, Mrs. Reed and her husband Richard became active in the work of the museum. From 1991 to 2002, they served as co-directors of the museum. 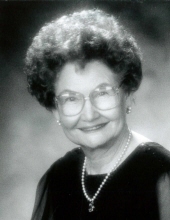 Mrs. Reed was a long-time member of the Missouri Association of the Deaf and the National Association of the Deaf. She is survived by niece, Valerie Herbold of Prescott, Az. ; long-time family friend, Earleene Gillett Hicks; and grand-nieces and nephews. In addition to her parents and husband, she was preceded in death by a brother, Jack Thompson. Memorial services will be held at 12:00 p.m. pm Friday, February 1, 2019 at Maupin Funeral Home in Fulton with Pastor Bruce Williamson officiating. Friends will be received from 10:00 a.m. until the time of service at the funeral home. Inurnment will be in Hillcrest Cemetery. Memorial donations are suggested to Missouri School for Deaf Welfare Fund, c/o Maupin Funeral Home, 301 Douglas Boulevard, Fulton, MO 65251. To send flowers or a remembrance gift to the family of Marthada Thompson Reed, please visit our Tribute Store. "Email Address" would like to share the life celebration of Marthada Thompson Reed. Click on the "link" to go to share a favorite memory or leave a condolence message for the family.